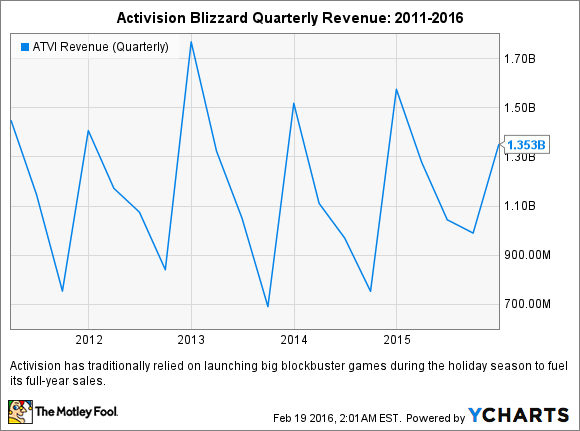 Is Activision Blizzard Inc. Stock Too Cheap To Ignore? Has the Call of Duty maker become a contrarian investment opportunity? Shares of Activision Blizzard (NASDAQ:ATVI) have fallen 25% since the beginning of the year, with most of the damage caused by a big earnings miss on Feb. 11. But after that plunge, has this video game titan become too cheap to ignore? Let's examine Activision's problems, catalysts, and valuations to decide. Last quarter, Activision's non-GAAP revenue fell 4.3% annually to $2.12 billion, missing estimates by $80 million. That sales decline during the crucial holiday quarter sparked a wave of price target reductions among analysts, which caused the stock to tumble as much as 13% on Feb. 12. Call of Duty: Black Ops 3. Source: Activision Blizzard. Activision's Call of Duty: Black Ops 3 sold well during the holidays, becoming the top-selling physical video game of the year despite being released in November. Unfortunately, sales of Activision's casual titles -- especially Skylanders SuperChargers and Guitar Hero Live -- were "weaker than expected" due to competition in the toys-to-life genre and casual gamers playing more mobile games. On the bottom line, Activision's non-GAAP earnings fell 12% to $0.83 per share, missing expectations by three cents. For the first quarter, Activision expects non-GAAP revenue to rise 14% annually to $800 million, which exceeds analyst expectations of $756 million. However, non-GAAP earnings are expected to fall 31% to $0.11 per share, well below the consensus estimate of $0.18. While Activision's short-term outlook seems shaky, investors shouldn't ignore three longer-term catalysts. First, the acquisition of Candy Crush Saga maker King Digital Entertainment (UNKNOWN:KING.DL) will boost the size of Activision's mobile gaming network to 500 million monthly active users (MAUs). Electronic Arts (NASDAQ:EA), by comparison, only had 150 million mobile MAUs at the beginning of the fiscal year. Activision believes that buying King will boost its non-GAAP revenues and earnings by 30% per share by 2016. That's why Activision stated last quarter that it expects full-year revenue and earnings to respectively rise 35% and 33% -- which both topped analyst estimates. Candy Crush Soda Saga. Source: King. Activision's deeper pockets can also help King develop more games to diversify its business away from the Candy Crush series. King's team can also develop more mobile versions of Activision's top franchises like Call of Duty or Warcraft. Higher revenues from mobile games will offset Activision's current weakness in casual games and support higher-margin digital sales, which accounted for over half of its top line last quarter. Second, Activision's creation of a dedicated e-sports division -- built upon the assets of Major League Gaming and IGN Pro League -- could help CEO Bobby Kotick achieve his goal of creating the "ESPN of e-sports." Superdata Research claims that there are already 134 million e-sports viewers worldwide today, and that figure could grow about 30% over the next five years. Showcasing its own games to those viewers could be a cheaper and more effective form of advertising than traditional ads. Lastly, Activision is still diversifying its business with new potential game franchises like Overwatch and TV and film projects like Skylanders Academy and Warcraft. If Activision's investments in mobile, e-sports, new franchises, and media pay off, its quarterly growth will stabilize throughout the year without relying on big quarterly spikes during the holiday season. But is the stock cheap? Activision stock currently trades at 25 times earnings, which is lower than EA's P/E of 30 and the industry average of 27. Looking ahead, Activision only trades at 14 times forward earnings, which is also lower than EA's forward P/E of 17. However, Activision and EA's respective P/S ratios of 4.6 and 4.3 still trade at a premium to the industry average of 3. Analysts currently expect Activision's annual earnings to grow 14% per year over the next five years. That gives it a 5-year PEG ratio of 1.2, which is higher than EA's ratio of 1.1. A PEG ratio under 1 is considered undervalued, so neither Activision nor EA look cheap based on their long-term growth forecasts. Looking ahead, the negative outlook regarding Activision's current quarter concerns King's growth, and market volatility might cause the stock to decline further. If that happens and pushes Activision's PEG ratio below 1, I'd consider the stock undervalued. But for now, I don't think Activision stock has become "too cheap to ignore" just yet.